Purely by coincidence, we visited the National Air and Space Museum on Saturday which happened to be the 45th anniversary of the first Moon landing. 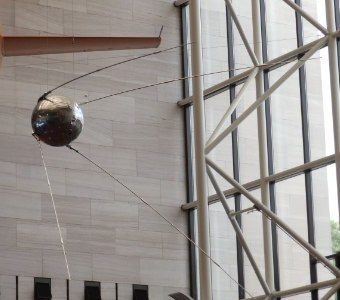 There, I again met my old nemesis, Sputnik. It was launched by the former Soviet Union on October 4, 1957. I was two years old. My father used to tell me that I was very concerned that Sputnik "was gonna get me." No, I am not neurotic. I suspect some encouragement by my parents. Last Thursday, I spent a pleasant morning at the Starbucks at the Hoffman Center talking with Jake, who is one of the regulars. He shared a way to understand the difference between neurosis and psychosis. "A neurotic is someone who believes that two plus two equals four and is deeply troubled by it. A psychotic is someone who believes that two plus two equals five and is quite happy about it."